Just ahead of the highly-contested midterm elections, Obama administration officials are denying rumors that they swapped Bowe Bergdahl, the soldier himself freed from Taliban captivity through a swap for five Guantanamo prisoners, for Marine Sergeant Andrew Tahmooressi. 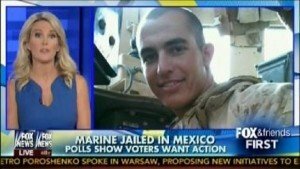 Tahmooressi was released by coincidence just before the election after several months in a Mexican jail. Bowe Bergdahl, serving with the U.S. Army in Afghanistan, ended up in Taliban custody. Some soldiers in his former unit straight-out called him a deserter who aided the enemy and put American lives in danger. The Army report on what happened is classified, so we’ll never really know. What is known is that to free Bergdahl, the Obama administration made a controversial decision to swap five Taliban prisoners at Gitmo (the U.S. government previously called one of them “among of the most significant former Taliban leaders detained”) for Bergdahl. Tahmooressi’s case is much less dramatic. He was no longer even an active-duty Marine when he drove his truck across the Mexican border “by accident” with three firearms and hundreds of rounds of ammunition inside. He did not declare the weapons and was arrested. He denied accusations he intended to sell the weapons in Mexico. 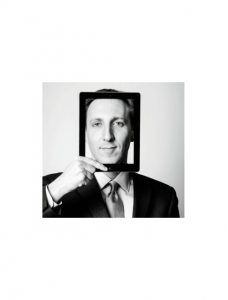 His case became a right-wing tool used against Obama. Very-briefly-Obama-UN-ambassador Bill Richardson was sent to Mexico last week and by some coincidence, just days before the contested midterm elections in the U.S., Mexico dropped all charges against Tahmooressi and he was returned to America for “humanitarian reasons,” ostensibly for treatment for PTSD from his Afghan service. Tahmooressi’s release was attributed by the Obama administration to successful diplomacy and advocacy on the part of the Obama administration. But speaking far off the record, sources inside the White House gave a different version of events. Refusing to speak on the record, Mexican authorities confirmed that all Americans are insane. Despite taking Bergdahl in what they term as a face-saving move, new directives now require Mexican police to conduct field mental illness tests on any Americans prior to arresting them. “Can’t they just stay on their side of the border?” asked the Mexican official in exasperation. 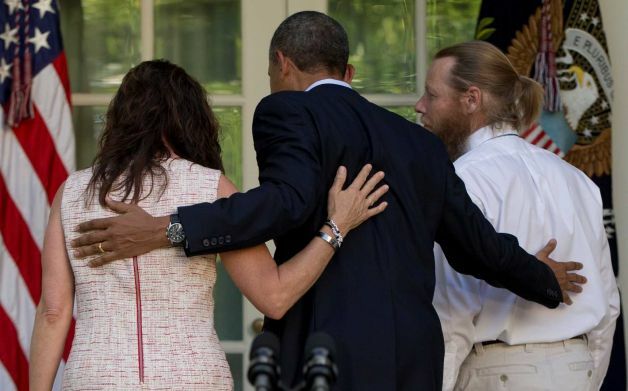 Let’s be clear: I am glad Bowe Bergdahl is home from five years with the Taliban. If he was truly captured on the battlefield, give him a parade. If he ran away, send him to trial. At the same time, the Obama administration’s bleating that “all the facts aren’t in” and that somehow after five years some sort of endless investigation needs to happen are just sad. The military has had five years to interview everyone they needed to, except Bowe. They have, no doubt, five years of intelligence, electronic eavesdropping and many, many pages of transcripts of what the Taliban said while negotiating with the U.S. over Bergdahl’s release. Bergdahl may have left letters behind before he disappeared, so some of his side has already been heard. Better (worse?) yet, the Army already has done an investigation. A classified military report detailing the Army’s investigation into the disappearance of Sgt. Bowe Bergdahl in June 2009 says that he had wandered away from assigned areas before — both at a training range in California and at his remote outpost in Afghanistan — but returned. The roughly 35-page report, completed two months after Sergeant Bergdahl left his unit, concludes that he most likely walked away of his own free will from his outpost one night, and it criticized lax security practices and poor discipline within his unit. But it stops short of concluding that there is solid evidence that Sergeant Bergdahl intended to permanently desert. The report is said to have been based extensive interviews with members of Bergdahl’s unit, including his squad leader, platoon leader, and company and battalion commanders. It is said to confirm certain other details relayed in recent accounts, including that Bergdahl shipped his computer and a journal home before he disappeared. It also confirms that he left behind his body armor and weapon, taking with him only water, knives and a compass. Now for all you Snowden accusers out there, who claim Snowden is a traitor because he did not “go through channels” and all that, take a close look at Brandon Friedman’s statements. He claims that if you’re in the military and have grown disillusioned and no longer trust your leaders (You out there Edward? ), it’s kinda sorta OK to just walk over to the Taliban and join their jamboree. After that, if any of your former squad mates call you out, well, they’re psychopaths and have a reason to smear you. Nope. Friedman served as an infantry officer in the U.S. Army’s 101st Airborne Division in Pakistan, Afghanistan, Kuwait, and Iraq. In March 2002, he led a rifle platoon into Afghanistan’s Shah-e-Kot Valley engaging Taliban and al Qaeda fighters as part of Operation Anaconda, a battle later written about in Not a Good Day to Die A year later, Friedman commanded a heavy weapons platoon during the invasion of Iraq. He led troops during combat and counterinsurgency operations in Hillah, Baghdad, and Tal Afar. He was awarded two Bronze Stars for his service in Afghanistan and Iraq. 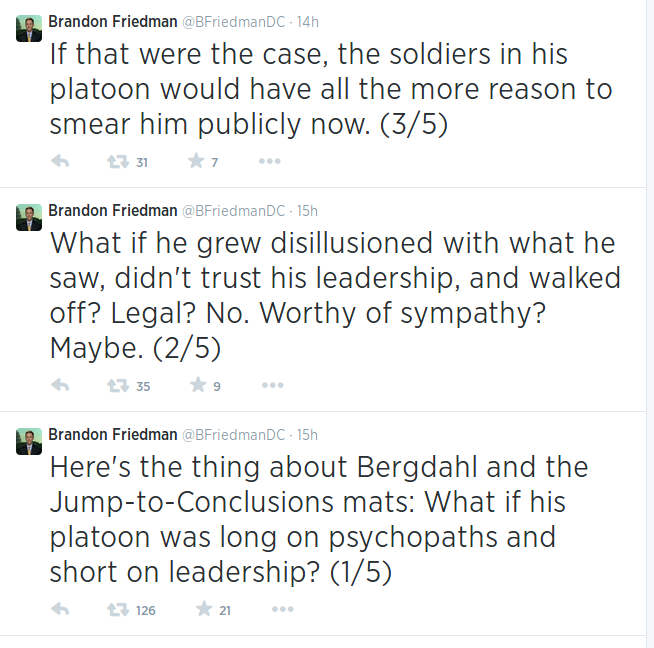 One doubts Friedman would have been so forgiving of his own deserting troops when he commanded in the field. In other words, he knows better but writes idiotic garbage such as those Tweets anyway. The Obama people knew all about Bergdahl. They knew of the serious questions about his disappearance. Yet they sent Susan Rice (again; she really just needs to sleep in on Sundays) on the talk shows to say he served “with honor and distinction.” Same swill from the State Department spokesperson. They have little bed bugs like Brandon Friedman out there saying ridiculous things. And there’s your tale of the infestation of the scabby syncophants we call our “government.” They’ll say and do anything to please their boss, with callous disregard for the public they are allegedly paid to serve. No man left behind? 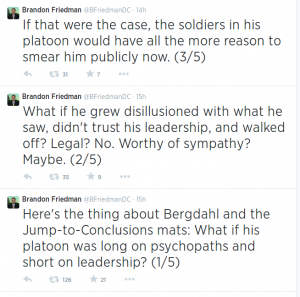 Brandon Friedman left himself behind and could do little more harm to respect and faith in government if he had joined up with the Taliban himself. I propose another swap. Send Susan Rice, too, for that matter. Or maybe just blame it all on some obscure anti-Islam video on YouTube?